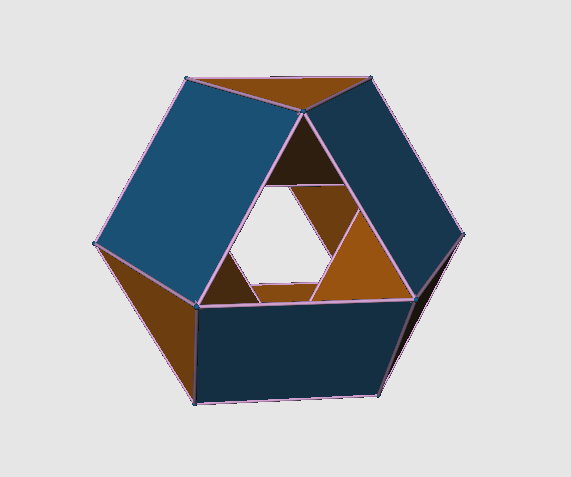 (which stacks and merges two octahedra, stacks them inside a triangular orthobicupola and subtracts them from it, removes the two additional coincident faces which off_align doesn’t, and then displays the result). If you don’t have Antiprism but you have something that’ll display OFF files, here it is: https://drive.google.com/open?id=1M_a474kL95XMdTl4qHHfH6AfCrm2Tnfw. And if you have neither, here’s a static image of it: And no, I am not planning on doing the same for J91/Z4 anytime soon. Feel free to take that on yourself.